Are you thinking an influencer marketing campaign and not sure where to start? Well then, you’re in the right place. Influencer marketing can be time-consuming and a lot of work, but with the right tools to help, it can be a simpler process that can yield amazing results for your business. In this blog post, I’m going to share the best tools to help you kick-start your influencer marketing campaign. Just a few years ago, everyone was talking about how influencer marketing is the next big thing. Turns out, they were quite right about that. Influencer marketing has become one of the most effective forms of digital marketing in recent years and is showing no signs of slowing down. And the reason for that is very simple: influencers have a lot of clout. They are very popular among their fans who not only check out all the latest content put out by them on a regular (even daily) basis, but they also have the power to make real change. They can help improve your brand awareness, your engagement, and your sales – and generally, influencer marketing can help you win your customers’ trust. Just look at what happened with Snapchat – one tweet from Kylie Jenner led to a snowball effect causing Snapchat’s stock to drop $1.3 billion in value. Obviously, this is a special case and most businesses probably couldn’t afford to work with an influencer this big. But smaller influencers can make a big impact on their audiences too; even with fewer than 100k followers on social media, if their audience trusts them and engaged with them, that means there’s great potential. Before you start your search, take a second to consider your audience: who are you targeting? Who forms your target audience? What are their ages, their professions, their needs, their interests? Knowing this can help you find influencers who are better suited to your campaign. Anyone you work with should target the same audience you’re targeting in order to be an effective influencer – otherwise, there’s no point if your product or service isn’t relevant to their audience. Secondly, take a look at the content they publish on their channels – blogs, vlogs, social media, magazines, and so on. Are they sharing content that is relevant to your target audience? Another important aspect to consider when looking for influencers is whether their audience is truly engaged. Follower numbers alone mean little – I’ve seen plenty of social media accounts with huge followings but little interaction; after all, followers can be bought, and some follow other users just for the sake of it. Look at their social media accounts, their blogs, and any other channels – how engaged is their audience? Are they sharing the influencers’ content with their own friends and commenting and liking their posts? 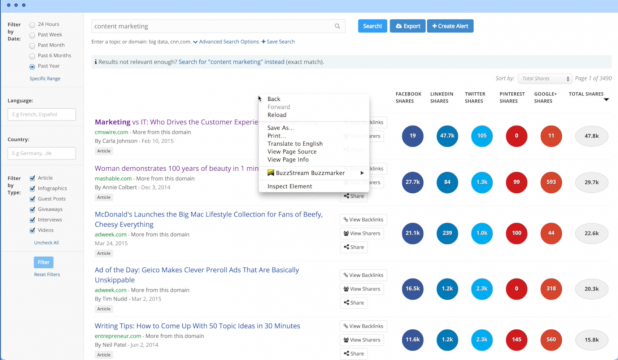 Upfluence is a favourite of mine because of its search engine capabilities. As a full-suite influencer marketing tool, it can help you manage your campaigns from start to finish, from finding social influencers to connecting with them and finally to monitoring and analysing your campaigns’ success. Circling back to its search features, the reason why I like it so much is because it not only has a lot of different filtering options, but also because you can actually search for influencers based on their social media audience. And as I mentioned earlier, this is one of the best ways to discover the right influencers for you. Plus, you can make sure that you find influencers that are local (if it’s relevant), influencers that have a blog or an email address available, and you can even search for influencers only on specific platforms, and who have a certain number of followers and a certain level of engagement. So, as you can see, it’s very easy to fine tune your search and make sure you only get the most relevant results. Once you’ve put together your lists of influencers, you can set up your outreach campaign with email templates to help you save time and finally, you can monitor your campaign to see who has responded or opened your emails, whether they engaged with you, and so on. Famebit takes a different approach to influencer marketing; it’s actually more of a community where businesses can connect with influencers and content creators rather than actively search for them. 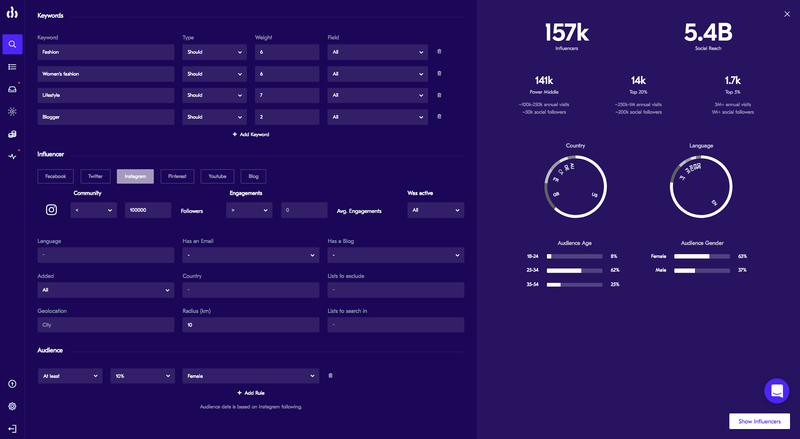 The tool – which is powered by YouTube, by the way – aims to simplify the whole outreach and influencer collaboration process and makes it easier to work with influencers. Once you’ve created an account, you can post a listing of sorts where you tell the community what you’re trying to achieve, what social media channels you want to target, what kind of content you’d want created, and what your budget is for the project. Basically, it works very much like a freelancer platform, as the content creators can then see your listing and make their own proposals to show you how they can help your business and what kind of content they’re thinking of creating to help your campaign, how long it would take them to create the actual content, and what their fee is. As for choosing the right influencer/content creator, you can filter through all the proposals you receive based on each influencers’ audience – namely, their audiences’ age and location. Buzzstream is a tool that helps you find influencers, as well as reach out to them, all with one platform. Their influencer search engine works a little differently to the other tools in this list – basically, the focus is on the content and on helping you find relevant websites/influencers that get lots of shares and create content that is in line with your requirements. When you search for these websites, you start by entering your keywords and you can then also use the different filters available: for example, you can filter by language or country (if you’re local), filter by the date the content was published, or filter by type of content (article, infographic, giveaway, and so on). As you can see in the screenshot above, each piece of content you find is accompanied by relevant social media sharing stats, and you can also quickly view who shared the post and what backlinks they have. This way, you’ll be able to prioritize the best influencers based on their shares. Additionally, you can also upload your own list of influencers if you have any, so you can manage your campaign from one platform. Once the list of influencers is ready, you can use Buzzstream as an influencer outreach tool to send them emails and track who’s responded/opened emails, as well as send them automated follow-ups (or get reminders to follow up manually). People trust other people more than they trust businesses; that, along with their clout over their audiences, makes influencers extremely powerful tools for raising brand awareness, generating demand for your business, and improving website traffic, conversions, and overall sales. And with a good tool to help you along the way, it doesn’t have to be as time consuming or as challenging a task to set up and manage your influencer marketing campaigns. Are you using influencer marketing to promote and grow your business? What influencer marketing tools have you tried so far and which do you prefer? Highly regarded on the world speaker circuit, Lilach has graced Forbes and No. 10 Downing Street. She’s a hugely connected and highly influential entrepreneur. She is listed in Forbes as one of the top 20 women social media power influencers, named one of 10 top digital marketers by Brand24 and was crowned the Social Influencer of Europe by Oracle.